The Jeep Safari is a celebration of Jeep (you may have pieced that one together yourself) and of the various ways you can have great big slabs of big boy fun out in the wilderness. It’s held out near Moab, which is in the south-eastern corner of Utah, east of Nevada and west of Colorado. It's an exceptionally pretty part of the world in terms of natural beauty. And, every Easter, this natural beauty is assailed by a phalanx of Jeeps and Jeep enthusiasts. That doesn't look like a proper off-roader. Well, you may have a point there. This one’s called the Quicksand, and it’s a cross between a hot rod and a desert-bashing weapon. There’s no slow, methodical rock-crawling in this thing’s future—it’s purely for all-out, full-throttle fun out on the dunes. Power comes from a 6.4-liter Hemi V8 with eight individually fuel-injected velocity stacks mated to a six-speed manual transmission. There’s also a ‘staggered’ tire setup—with 37-inch tires out the back and 32-inch rubber up front. What's special about this one? 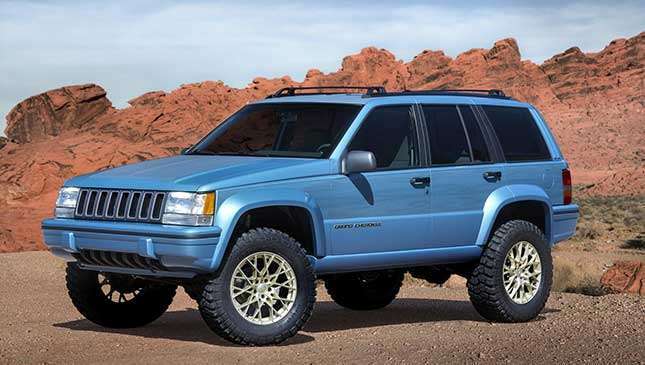 It looks like an old Grand Cherokee. The 5.2-liter V8 runs through a four-speed auto and on to some thoroughly beefed-up axles. Yes, we said four-speed. And that’s because this particular Jeep is laying on the nostalgia pretty thickly—there’s an in-car phone, a David Hasselhoff sticker, and an original Game Boy in the back seat. Really. That’s because the ZJ Grand Cherokee is nearly 25 years old and the Jeep boys want to celebrate it. There’s every possibility that this is the first Jeep product that most of the Gen Y generation saw first, so bringing it back to a mint-condition, trail-prepped condition is a bit of a nostalgia trip. 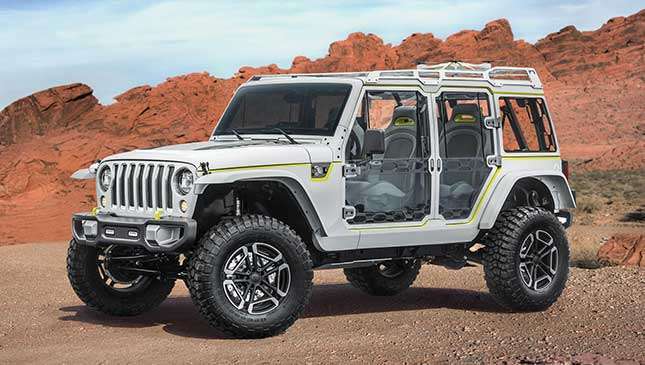 By trail-ready, we mean that the Grand One nets a longer wheelbase, a two-inch suspension lift and new wheel arches to hold the 33-inch tires. What about Wranglers? It's not Jeep without Wranglers. 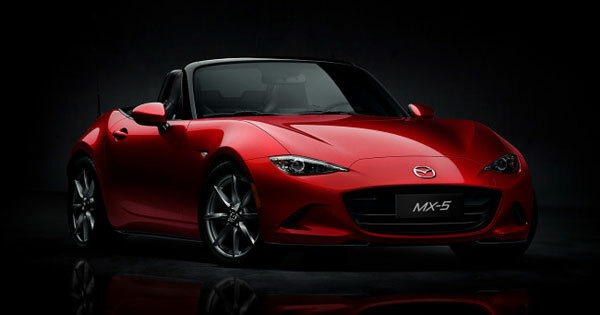 To do so, the doors are made from clear plastic, and the hardtop roof is translucent for an extra-airy feeling. The rear doors are hinged backwards, like a plastic, off-road Rolls-Royce. Lovely. That's unique. What about something a little more down-to-earth? Right this way—this one’s called the Switchback. 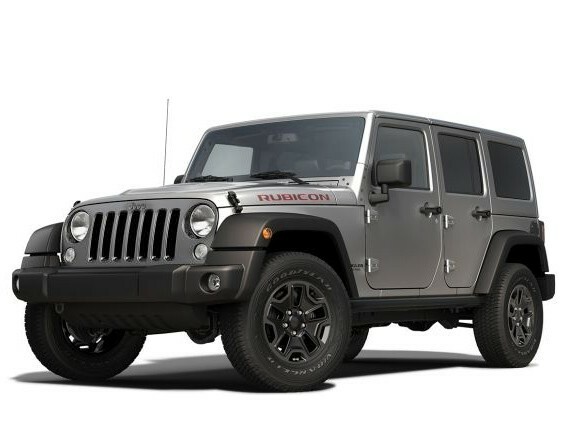 There’s a four-inch lift, with the off-road Dana 44 axles transferring power from the Pentastar 3.6-liter V6. There are also ‘half doors,' which have special viewport in the bottoms, as well as Katzkin leather seats. I said down to earth. Not half-doors and leather seats. Golly, you are hard to please. How about this—the Luminator? It’s just a pretty standard Jeep, liberally coated with lights. They are pretty trick lights, to be fair. The ones at the front swivel, depending on steering angle, and the rear lights work as a scouting tool. We’ll explain. It’s like a traffic light—green, amber and red—but in this case, the yellow light means to approach slowly, not barrel through before it goes red. 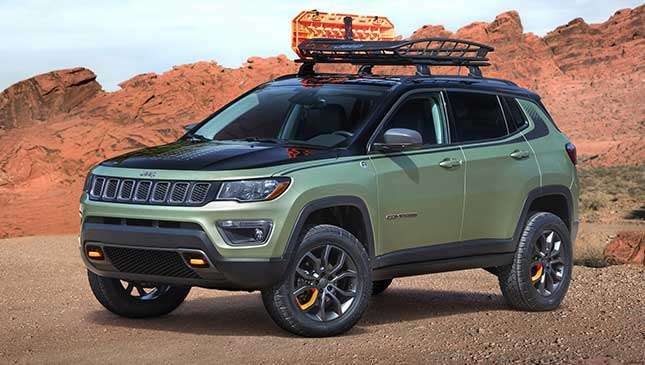 As you can see, it isn’t—it’s a Jeep Compass with big wheels, tall suspension and some girders to protect the underside. Underneath, there’s a 2.4-liter four-cylinder with a hilariously overegged name—‘Tigershark’—hooked up to a nine-speed transmission. Fine. Show me the old stuff then, grandpa. That’s more like it. Check this out, then—the CJ66. 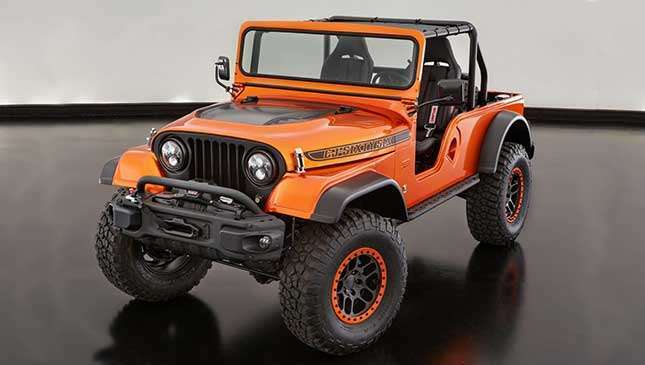 It’s not an actual CJ Jeep, but rather more of an off-road Singer—take a newer model, then make it look old. 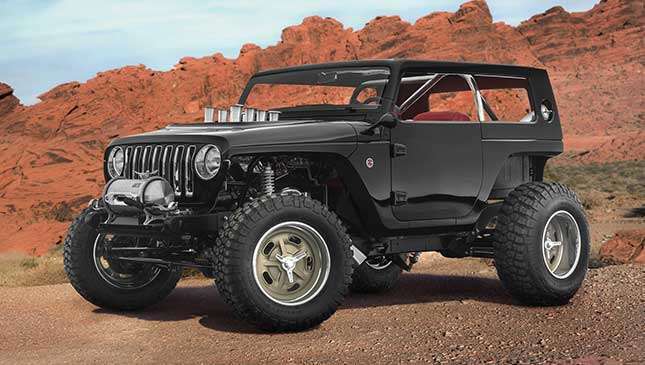 So, there’s a TJ frame, with 1966 CJ bodywork on it, powered by a 5.7-liter Hemi V8. And these are very good things. 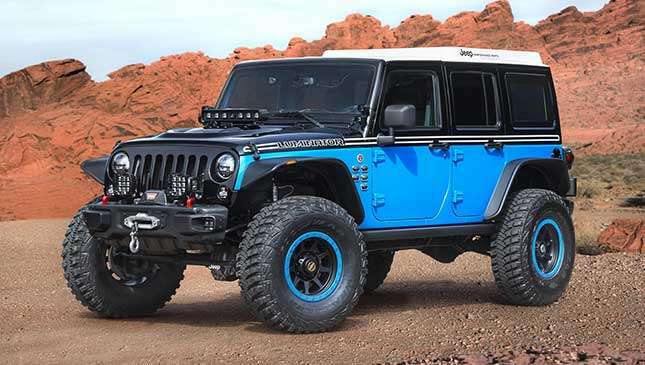 More than 380hp is fed through a six-speed manual to a pair of Dana 44 axles, which transfer everything to the sand/rock/dirt via 35-inch off-road tires. So, which is your favorite? And why is it the CJ66?